Stair-climbing machines offer a vigorous cardiovascular workout. Ready to reclaim the power of that hourglass figure? Not only does stair stepping provide an excellent cardiovascular workout, but it also offers a low-impact boost to strength and muscle tone in the lower body, according to a report by “Chicago Tribune” health and fitness writer Julie Deardorff. And exercise science professor Michele S. Olson tells “Fitness Magazine” that the stair climber promotes lean, toned muscles -- not bulky ones. That means you can focus on conditioning and building endurance while simultaneously sculpting covetable legs and a shapely backside. Maximize the effect of your aerobic workout by zeroing in on good form when using a stair-climber machine. Pennsylvania trainer and mixed martial arts conditioning coach Corey Dissin advises keeping the back upright and avoiding rounding the lower back. Bend forward just slightly at the hips, while also locking your sight straight ahead. For stability, it’s a good idea to glance down at the pedals or steps now and again, until you get the hang of the rhythm. 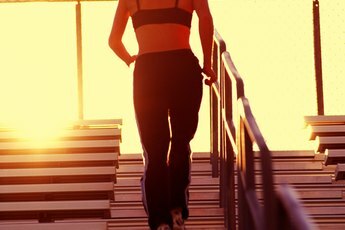 For stair-stepping newbies, start off cautiously, aim for an even-tempo pace and grow your routine from there. In a report for Weight Watchers, personal trainer William Sukala recommends a slow or moderate pace with a starting goal of 10 minutes per session. When that target becomes old hat, bump up your time limit and find a pace that will continue to elevate your heart rate to the target zone. Dissin advises keeping the entire foot on the machine’s pedal to avoid over-taxing muscles in the calves. After mastering the basics, it’s easy to mix in some variety, even on a machine as straightforward as the stair stepper. Switch up your foot positioning to get a different kind of burn. By bearing down on the heel, you’ll feel it predominantly in your glutes. Likewise, stepping on the ball of your foot will activate your quadriceps, Chicago trainer Sergio Rojas told the “Chicago Tribune.” Also try altering your pace -- and thus, the depth of each step -- for lengths at a time. Take shorter, faster steps for a few minutes, and then deepen your step with a slower pace for the next stretch. Use these variations within a single session to achieve a well-rounded, lower-body workout that targets the tough-to-tame regions of the thighs and derriere. Power up your cardio session on the stair climber by incorporating alternative strength-training exercises for your legs on other days of the week. Twice-weekly strength-training workouts are an ideal cross-training tactic for stair stepping, according to fitness instructor and Minneapolis-St. Paul studio owner Lisa Van Ahn. She recommends squats, lunges and planks to build muscle strength in the legs.